Review: Desperate and alone, eleven-year-old Daniel Sartain must deal with the inexplicable horror of not only losing the one person who means the world to him, but being the cause of that untimely death. And so begins Donny Bailey Seagraves novel, Gone From These Woods. Daniel is a good kid who suffers from a dysfunctional family life. The one person who seems to bring order to Daniel’s world, however, is his uncle Clay. On one horrific morning when Clay is teaching Daniel to hunt - because all Sartains hunt - Daniel struggles. He wants so much to be a “man” and make his uncle proud, but Daniel can’t bring himself to take the life of even a rabbit. That’s when the tragedy happens. When Daniel waits too long to shoot the rabbit, he stands up and changes his life forever, for his gun accidentally fires and takes the life of his uncle. Throughout the novel, Seagraves takes the reader through a heart-wrenching story of a young boy who must somehow come to terms with his loss and his guilt while at the same time find a way to live in a family of abuse. 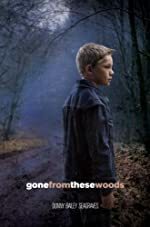 Gone From These Woods is a deeply moving novel. It opens the reader’s eyes to death and life, to forgiveness and rage, to love and hate, and ultimately to hope. Seagraves paints a picture of a boy, like any other boy, having to deal with the worst the world can offer. The reader is able to feel his pain and to want so badly to feel his joy. Through Seagraves writing, the reader sees inside the pain. In one passage when Daniel is working with a social worker he says to himself, “What if I told her how I practiced my Daniel’s okay look every day in front of he bathroom mirror, like I was rehearsing for a play? Turning my lips up at the corners so it looked like I was smiling. Making these loud chuckling sounds so I’d be ready if someone told a joke.” What a wonderful analogy for grief and the countless masks one must don! Daniel must come to terms with much more than any 5th grader should have to embrace. A struggle with the novel is the age of Daniel. In some ways he seems so mature, but then he talks about reading groups in school. It seems like his experience would fit better for a middle-school child. In the same way, the book is more appropriate for middle-school children. The depth of the emotions and the seriousness of the issues which Daniel must overcome might be lost on a younger reader. To truly appreciate Gone From These Woods a basic maturity level must be reached. Nonetheless, Gone From These Woods is a powerful read and highly recommended. We would like to thank Random House for providing a copy of Gone From These Woods for this review. Have you read Gone From These Woods? How would you rate it?